The train from Inverness pulled into London just a few minutes late, depositing me at Euston Station. It was 8am, and the place was buzzing with commuters. I managed to manoeuvre myself and my backpack through the station without hitting too many people and found the Left Luggage counter, where, following the tradition, I left my luggage. Then I took a tube south to Leicester Square for a walk around the streets of London. They varied between packed and quiet, but because they were all new to me, they all looked interesting. I found Piccadilly Circus, and just stood there for a while, looking at the signs, watching the buses rush past, caught up in the Londonness of it all. Some of the buses had open doorways and conductors, which reminded me of the good old days in Melbourne when the trams were like that, and you could sit in the doorway on a summer’s day, the breeze on your face – unless the conductor got to that spot first. I kept walking and found one of the many bridges over the Thames: Waterloo Bridge. I strolled out into the middle of the bridge, walking past a bus with some worried official-looking people sitting in front of it, examining a bloke who looked like he had been hit by it. An ambulance and several police were in attendance, and although I didn’t stop to look too closely, the bloke seemed to be remaining in the land of the living for at least the moment. One can only hope that he had listened to his mother, and that he was wearing clean underwear. At that moment, I made myself a promise that I was to keep throughout the rest of my trip: That I would never, ever jaywalk in London. It’s just too dangerous. The Thames looked magnificent in the sunshine. I looked south towards Westminster and the Houses of Parliament and Big Ben and other such famous landmarks. Then I looked north towards… umm… some bridge of other. I could see the distinctive dome of St Paul’s Cathedral though. To be quite honest, just standing, leaning on the edge of the bridge, and watching the busy city before me, it felt great to be alive. I headed up towards St Paul’s, along the Strand, taking careful note of where Australia House and the Qantas office were. Strand becomes Fleet Street after a while, a name synonymous with the British press, even though most of them have apparently moved away. And then I came to it, St Paul’s Cathedral, in all its massive glory. I walked around it for a bit, trying to work out how to get it all into a picture. In the end I was feeling conscious of the growing credit card bill that would be awaiting me when I got home, and didn’t pay the entrance fee to go in, instead enjoying the free part of St Paul’s – the toilets and the gift shop. Besides, I had seen other highly impressive churches, and I had other fish to fry, and it was after 11am – when those other fish would be available for frying. So I found the tube station and caught a train back to Convent Garden (change at Holborn) and headed for the London Transport Museum. The thing about the London Transport Museum is that everybody I know of who has been there, even those not particularly interested in transport, has raved about it. This is the kind of stuff that would normally put my sister instantly to sleep, but she loved it. So I, having a bit of an interest in transport-related matters, well, I had to go. So I rocked up, paid my five quid to get in, and looked around. For me, it was heaven. I was there for almost four hours. I looked, climbed aboard, pressed buttons, watched videos, examined everything in detail. It was fascinating. Perhaps it wouldn’t be to everybody on the planet, but it certainly was to me. For an unbelievably long time I chatted with a bloke dressed up as a 1930’s London tram conductor, about the trams we still had at home in Melbourne, and various other related topics. Answering my multitude of questions and chatting for so long, he was either being incredibly polite, or genuinely was interested in his job, and I think it was the latter. Unlike most of the other Brits I would meet, he had actually been to Australia, but hadn’t got to Melbourne. Next time, he promised. It was about 3pm by the time I left, having burnt more time in the brilliant museum shop (which you can get into for free, by the way). Then I noticed that once again my appetite was calling for lunch to be the top priority. I wandered around, my appetite once again frustrated by the very indecisive section of my brain that’s in charge of choosing food. Eventually I settled for a meal of relative cheapness, quick preparation and minimal decision (can we all spell golden arches?). I headed back to the Qantas office in the Strand to do some rejigging of my plane tickets, and then decided I was in need of an e-mail fix. Looking at a list of London net cafes I had obtained earlier, I decided to take a trip out to Earl’s Court to find the one there. 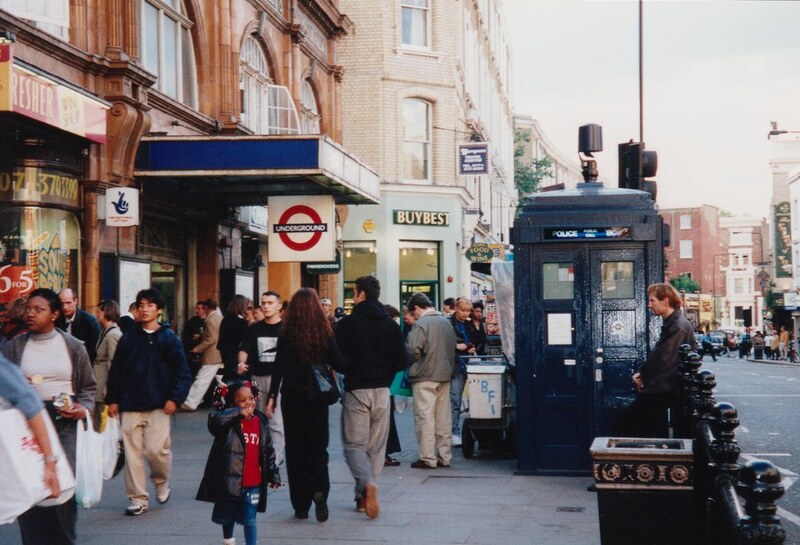 Coming out of Earl’s Court station, there is a surprise for anybody who was ever a Doctor Who fan. Sitting on Earl’s Court Road just outside the station, is a Police Box. The full monty, sitting there on the street, resplendent in bright blue paint. It doesn’t seem to work as a phone, let alone a time machine, but it looks impressive. With the aid of the trusty A to Z, I found the Net cafe, sat down and got my e-mail, then headed back to the station. I was back on the train before I realised I’d left the priceless A to Z (which didn’t even belong to me) on the table in the cafe. I got off at the next stop, caught a train back, and found it still sitting on the table. Phew. I’d have been lost without it. In search of obscure landmarks, I headed for Paddington Station, which is where Paddington Bear got his name. Being peak hour, it was bustling with commuters, and there were very few bears around. In fact, I didn’t spot any. But as the bloke at the London Transport Museum had promised, the massive arched roof was very impressive. I walked out to the street to find a bus, any bus, for a joyride. Not the kind of joyride where you break-in, steal the vehicle and drive at high speed through the streets before crashing into half a dozen garbage bins while being chased by the cops. More the kind where you get on board, show your Travelcard, settle down into the nearest comfortable looking seat and watch the world go by. The bus rumbled down busy streets, and onto Edgeware Road, which for some reason I have in mind is always referred to in British TV series not as “Edgeware Road”, but “The Edgeware Road”. I’m not sure why this is, but I got off the bus just around the corner, at Marble Arch. Marble Arch is known as Marble Arch, because of the incredibly simple reason that there is an arch made of marble there. Hence, Marble Arch. Marble Arch, in particular the tube station, is another obscure landmark because in one Doctor Who episode set far in the future they find the remains of the station. I don’t remember the name of the episode, but it was one of the ones just before Colin Baker got sacked. After this I headed back to Euston Station for my backpack, which had apparently not attracted any attention from security personnel, and had not been blown up in a controlled explosion. I took it to Victoria Station to catch a train to East Croydon, where I phoned my Uncle Hew. I would be staying at his place for a few days. He met me at the station and we walked to where he’d left his car outside a nearby building known locally as the thruppenny bit, because of its shape. We went to his house, had some dinner, drank some beer, and chatted about everything under the sun until about 2am, after which my head hit the pillow in the spare room with some speed.